WHEN John Chaplin passed away yesterday evening, aged 85, speedway lost more than simply a journalist who has covered the sport for the past 60-plus years. Magazine columnist, author of a dozen speedway books and a more than capable TV commentator, Walsall-born Chaplin was a passionate historian who fell in love with the game from the day he was first taken along to Birmingham by his mother Doris at the age of 12. He has contributed significantly to our quarterly Classic Speedway magazine virtually from its launch in 2008, having founded (with Peter Lipscomb) and edited its predecessor, Vintage Speedway Magazine for 10 years from 1993. NEW year and a new home for Retro Speedway. We are pleased to confirm that we have relocated our main UK distribution office to the Derbyshire peak district town of Glossop. However, all of other contact details – telephone number, email and web addresses – remain unchanged. Clive Read: "A big thank you from me for your Memories of Coventry Speedway. I have finished watching all three DVDs and have been meaning to drop you a line to say what a fantastic set of memories you've managed to compile. I learned a few things about the early history of the stadium and it never ceases to amaze me how much rare footage there is out there, especially pre-TV/camcorder days. As you know our first associations go back to August 16, 1975 (a date I have no trouble remembering) and a 40-38 win over Wimbledon. I really liked that you filled in the eras without video with photographs of the riders of the day – big stars and the local riders who were often even more popular because of their connection to the club. Some of those black and white images from 1975/76 brought the memories flooding back. You did a really lovely touch with my Dad's cine film, thank you. Sadly, Ole didn't beat Hans Nielsen that evening but it reminded you how quick the races were (even before laydown engines) and the closeness of the racing. I remember Ole's very first appearance in a Bees' race jacket, when several thousand of us turned up for the practice session in freezing weather a week before the tapes went up in 1976. I have a framed photo at home of Ole signing my brother Jon's autograph book (yes, he's still got that) and the rest of us cheering on. A week later, in Heat 1, he shot out of the gate, looked right and shepherded Alan Molyneux around for four laps, with Ray Wilson diving inside and out but unable to get past. The first of many times he'd lead us to victory. Other great races were captured and for those for which you didn't have images, it's brought back memories of many other races and meetings: Jon always recalls the dead-heat in May '76, when Nigel Boocock stalked Tommy Jansson for four laps, a couple of weeks before he was so tragically killed; the British Final of 76, where Simmo was "Super"; those perennial clashes with Cradley which ITV did so well to cover; and the 1979 title decider against Hull. You have compiled yet another fantastic and evocative collection of happy days, of great racing, drama and good times, so thank you. This is a must-buy for any Bees fan. My over-riding impression is actually that Coventry was far less of a gater's track than it was often criticised for and that it provided me and thousands of other fans with so many happy times. The sad decline of the sport generally and the devastation of the stadium is awful for those of us who had such happy times over so many years. It was fitting that the last true memory went to Booey and the resting of his ashes. While the stadium may disappear, the happy times, the drama, the noise and smells will live forever." Speedway Plus (www.speedwayplus.com): "Memories of Coventry Speedway is a six-hour epic that is an absolutely essential purchase for anyone who has spent happy evenings in CV8. "Ole Olsen gives a lengthy interview, conducted recently, interspersed with archive clips of him in action for the Bees during his hey-day. It's clear that his influence over the club extended far beyond that you would normally expect a rider to have. Clearly inspired by the way that Ivan Mauger would transform a club, Olsen worked closely with promoter Charles Ochiltree to decide which riders would be signed and how the team would operate. "There are hundreds of little moments on these DVDs that will transport you back to happier times. This production has clearly been a labour of love, it's beautifully put together and a "must have" for anyone who has ever supported the Bees. Even if you're a fan of another club, there's plenty here for you to enjoy too, a simply marvellous product that we highly recommend." Garry Cambridge: "It's absolutely fabulous. Every Bees fan should have one. In fact, every speedway fan should! How lucky we were. They were the best of times. I watched the third disc last night and, of course, it has to include some images of the unthinkable, because it is the reality. I sensed in Tony Mac's narration his frustration at the senseless situation in which we find ourselves , because he's a speedway man and this is an incalculable loss to speedway. This is, for all that, a fabulous, absorbing production for any speedway fan and not just Coventry fans. Well done, Retro Speedway, it's superb, great stuff." Jill Thomas: "Brilliant, really enjoyed it." 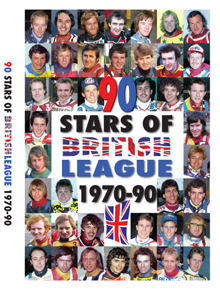 Speedway Plus (www.speedwayplus.com): "A great mix of nostalgia, controversy and great racing." 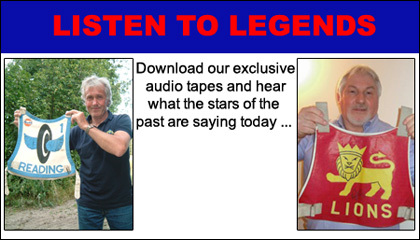 Duncan Pemberton: "If you haven’t bought this DVD and you hanker for memories of the golden era, you HAVE to buy this. Glass of wine, stick it on and sit back and wallow in the time speedway was BRILLIANT. Your DVDs are great." Speedway Star review by editor Richard Clark (Dec 8, 2016):"If you don't want these in your Christmas stocking, you're not a speedway fan. Only in speedway can you get such a colourful cavalcade of characters all so willing to talk openly and honestly about their time in the sport." Speedway Plus (www.speedwayplus.com): "If you're a fan of 70s, 80s and 90s speedway who doesn't subscribe to Backtrack, then this will definitely appeal to you. Lots of the stars of those decades are able to speak with a candour that wouldn't have been possible during their careers." appeal to you. Lots of the stars of those decades are able to speak with a candour that wouldn't have been possible during their careers. Speedway Plus (www.speedwayplus.com): "The box-set is a must for every fan of speedway in the 70s and 80s. Peter Collins is one of the most entertaining speedway riders of all-time and this is packed with many great examples of his talents. There's the usual regret that he didn't race in the HD television era, but the quality of the racing makes up for the quality of some of the available footage." Phil Collins (brother of PC): "Just seen the trailer. Get your copy. This would make a great Christmas gift, especially for dads and mums who would remember Peter when he was The Man." Speedway Plus (www.speedwayplus.com): "These DVDS are a useful reminder of some of the less celebrated Americans to make their way over the Atlantic. Names like Randy Green, Eddie Ingels, Ron Preston and Robert Pfetzing have slipped from memory over the years, so it's great to see them featured here. Running to four hours, there's enough great speedway action to keep any fan entertained, especially those that were seduced by the glitz and glamour of these All-American Boys." Gerald Clark: "Brilliant rider, great DVD." 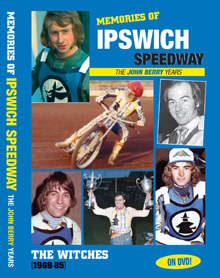 Speedway Plus (www.speedwayplus.com): "It's a remarkably honest and detailed account of his career, also touching on his upbringing and his life since he retired. He's equally honest about his personal life in the UK, candidly discussing the tragic loss of his young son (Jamie) and the breakdown of several long-term relationships. 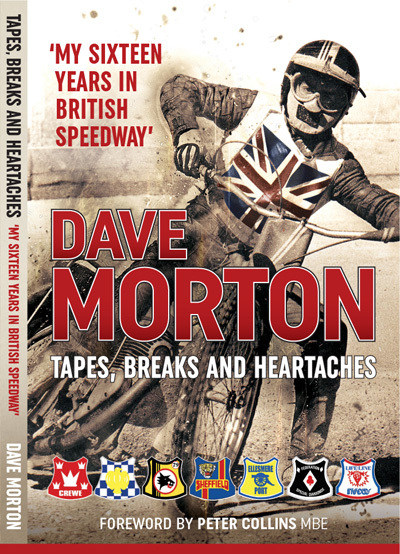 Although Dave Morton initially seemed a slightly unlikely candidate for the autobiography treatment, he's got an interesting story to tell. He certainly lifts the lid on some speedway happenings that haven't become public previously. A very enjoyable and insightful read." From Facebook . . .
Harry Harrison: "Much better read than the majority of autobiographies around by sports 'personalities'. Dave really did everything his way, and when it really was tough. "They say never meet your heroes. Well, I was fortunate to meet Dave, a sharp to fantastic guy. Incredibly humble and genuinely pleased to meet and greet his fans. Dave Morton, you really are a legend." Lee Kilby: "Absolutely terrific read. Highs and lows a plenty. Such a shame Dave picked up so many injuries, who knows what he could have achieved. Thanks, Dave, for telling your story and Tony Mac for getting it out to us." Doug Nicolson: "Really enjoyed the book, a good read. Enjoyed his take on the goings-on the night Ellesmere Port came to Blantyre 2, when track staff – rather than the referee – stopped a race! Great moments in sport." Paul Clements: "I read the book, enjoyed it, couldn't put it down." Phil Collins: "Hey Mort, after four sittings I read it from cover to cover. I just felt compelled to send you a note and let you know how much I enjoyed it. Well done, 'Big Mort'." Glen Belcher: "Dave Morton's book was a great read from start to finish. I had seen Mort ride a couple of times and remember well the 'events' of the night of April 6, 1976 at Blackbird Road. I remember it, because you rode wearing my favourite number 6. I remember your 'off'. I remember Ray Wilson being carted off and I remember having a good old night of it with mates, because the 6th of April is my birthday and I was 22 that night. The early days described riding home-made bikes on fields were just like re-living my own young life. 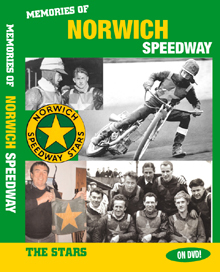 "Brilliant book, full of speedway anecdotes (obviously), but also the human and ordinary side of the sport with friends and family involved. I found myself saying things like, 'Ah, we did that once' and, 'Yeah, we drove one of those'. "And, of course, the heartache noted in the title with relationship problems and decisions over clubs and money matters, etc, all eclipsed by a real tragedy – again, written with real feeling – that makes Chapter 14 impossible to read with dry eyes. I can recommend it." Geoffrey Tomlinson: "It's a great book, Glen, and Dave is a top man. I was at Foxhall when he had a nasty crash. Everybody was worried for him, but he came through and continued racing for a few years after that. A mark of the man. "It's the type of book you read through, then continue to read again and again, there is so much in it. I suggest you buy it for £16 – a bargain." Brian Ford: "Found it a great read, an insight into your career, life and you as a person. Meeting you today was a pleasure." Mike Cowley: "If you haven't bought Dave's book, it's probably the best £16 you will spend. A fine read, thoughtful and well written, and a great insight."